Area: 276,840 sq. km; about the size of Colorado. Cities: Capital--Quito (pop. 1.6 million). 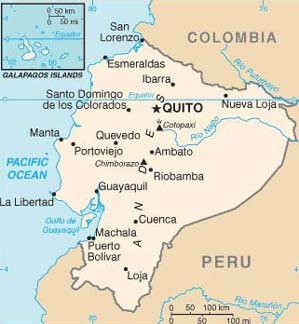 Other major cities--Guayaquil (2.4 million). Terrain: Jungle east of the Andes, a rich agricultural coastal plain west of the Andes, high-elevation valleys through the mountainous center of the country and an archipelago of volcanic islands in the Pacific Ocean. Climate: Varied, mild year-round in the mountain valleys; hot and humid in coastal and Amazonian jungle lowlands. Annual population growth rate (July 2005 est. ): 1.24%. Ethnic groups: Indigenous 25%, mestizo (mixed Indian and Spanish) 65%, Caucasian and others 7%, African 3%. Religion: Predominantly Roman Catholic (95%), but religious freedom recognized. Languages: Spanish (official), indigenous languages, especially Quichua, the Ecuadorian dialect of Quechua. Education: Years compulsory--ages 6-14, but enforcement varies. Attendance (through 6th grade)--76% urban, 33% rural. Literacy--92%. Health: Infant mortality rate�23.66/1,000. Life expectancy�76.21 yrs. Independence: May 24, 1822 (from Spain). Branches: Executive--President and 15 cabinet ministers. Legislative--unicameral Congress. Judicial--Supreme Court, Provincial Courts, and ordinary civil and criminal judges. Major political parties: Over a dozen political parties; none predominates. Suffrage: Obligatory for literate citizens 18-65 yrs. of age; optional for other eligible voters; active duty military personnel and police may not vote. GDP: (2005 est.) $32 billion; (2004 est.) $30 billion; (2003) $27.2 billion; (2002) $24.3 billion. Per capita GDP: (2005 est.) $2,424; (2004 est.) $2,304; (2003) $2,118. Natural resources: Petroleum, fish, shrimp, timber, gold. Agriculture, including seafood (9.8 % of GDP in 2004; 9.6% of GDP in 2005 est. ): Products--bananas, seafood, flowers, coffee, cacao, sugar, tropical fruits, palm oil, palm hearts, rice, corn, and livestock. Industry (12.5% of GDP in 2004; 12.5% of GDP in 2005 est. ; oil and mining--23.3% in 2004; 23.6% in 2005 est. ): Types--petroleum extraction, food processing, wood products, textiles, chemicals, and pharmaceuticals. Other major contributors to GDP: Commercial trade (wholesale and retail): 15.1% (2004), 15% (2005 est. ); transportation and communications: 9.8% (2004), 9.8% (2005 est. ); construction: 7.3% (2004), 7.3% (2005 est.). Trade: Exports--(2004) $7.66 billion; $7.2 billion (2005 est.) . Types--petroleum, bananas, shrimp, coffee, cacao, hemp, wood, fish, cut flowers. Major markets in 2003--Latin America 35.26%; U.S. 34.56%, European Union (EU) 14.62%, and Asia 5.41%. Imports--(2004) $7.27 billion; $7.9 billion (2005 est.) . Types--industrial materials, nondurable consumer goods, agricultural products. Major suppliers (2003)--Latin America 51.57%, U.S. 17.46%, Asia 12.28%, and EU 10.12%. Ecuador's population is ethnically mixed. The largest ethnic groups are indigenous and mestizo (mixed Indian-Caucasian). Although Ecuadorians were heavily concentrated in the mountainous central highland region a few decades ago, today's population is divided about equally between that area and the coastal lowlands. Migration toward cities--particularly larger cities--in all regions has increased the urban population to over 60%. The tropical forest region to the east of the mountains remains sparsely populated and contains only about 3% of the population. Due to an economic crisis in the late 1990s, more than 600,000 Ecuadorians emigrated to the U.S. and Europe from 2000 to 2001. It is estimated that there are over two million Ecuadorians currently residing in the U.S.
Advanced indigenous cultures flourished in Ecuador long before the area was conquered by the Inca Empire in the 15th century. In 1534, the Spanish arrived and defeated the Inca armies, and Spanish colonists became the new elite. The indigenous population was decimated by disease in the first decades of Spanish rule--a time when the natives also were forced into the "encomienda" labor system for Spanish landlords. In 1563, Quito became the seat of a royal "audiencia" (administrative district) of Spain. A coastal-based liberal revolution in 1895 under Eloy Alfaro reduced the power of the clergy and opened the way for capitalist development. The end of the cocoa boom produced renewed political instability and a military coup in 1925. The 1930s and 1940s were marked by populist politicians such as five-time President Jose Velasco Ibarra. In January 1942, Ecuador signed the Rio Protocol to end a brief war with Peru the year before. Ecuador agreed to a border that conceded to Peru much territory Ecuador previously had claimed in the Amazon. After World War II, a recovery in the market for agricultural commodities and the growth of the banana industry helped restore prosperity and political peace. From 1948-60, three presidents--beginning with Galo Plaza--were freely elected and completed their terms. The 1984 presidential elections were narrowly won by Leon Febres-Cordero of the Social Christian Party (PSC). During the first years of his administration, Febres-Cordero introduced free-market economic policies, took strong stands against drug trafficking and terrorism, and pursued close relations with the United States. His tenure was marred by bitter wrangling with other branches of government and his own brief kidnapping by elements of the military. A devastating earthquake in March 1987 interrupted oil exports and worsened the country's economic problems. Rodrigo Borja of the Democratic Left (ID) party won the presidency in 1988. His government was committed to improving human rights protection and carried out some reforms. Most notably, Borja opened Ecuador to foreign trade. The Borja government concluded an accord leading to the disbanding of the small terrorist group, "Alfaro Lives." However, continuing economic problems undermined the popularity of the ID, and opposition parties gained control of Congress in 1990. In 1992, Sixto Duran-Ballen won in his third run for the presidency. His government succeeded in pushing a limited number of modernization initiatives through Congress. Duran-Ballen's Vice President, Alberto Dahik, was the architect of the administration's economic policies, but in 1995, Dahik fled the country to avoid prosecution on corruption charges following a heated political battle with the opposition. A war with Peru erupted in January-February 1995 in a small, remote region where the boundary prescribed by the 1942 Rio Protocol was in dispute. Abdala Bucaram, from the Guayaquil-based Ecuadorian Roldosista Party (PRE), won the presidency in 1996 on a platform that promised populist economic and social policies and the breaking of what Bucaram termed as the power of the nation's oligarchy. During his short term of office, Bucaram's administration drew criticism for corruption. Bucaram was deposed by the Congress in February 1997 on grounds of alleged mental incompetence. In his place, Congress named interim President Fabian Alarcon, who had been president of Congress and head of the small Radical Alfarist Front party. Alarcon's interim presidency was endorsed by a May 1997 popular referendum. Congressional and first-round presidential elections were held on May 31, 1998. No presidential candidate obtained a majority, so a run-off election between the top two candidates--Quito Mayor Jamil Mahuad of the Popular Democracy party and Alvaro Noboa of the Ecuadorian Roldosista Party (PRE)--was held on July 12, 1998. Mahuad won by a narrow margin. He took office on August 10, 1998. On the same day, Ecuador's new constitution came into effect. Mahuad concluded a well-received peace with Peru on October 26, 1998, but increasing economic, fiscal, and financial difficulties drove his popularity steadily lower. On January 21, 2000, during demonstrations in Quito by indigenous groups, the military and police refused to enforce public order. Demonstrators entered the National Assembly building and declared a three-person "junta" in charge of the country. Field-grade military officers declared their support for the concept. During a night of confusion and negotiations, President Mahuad was obliged to flee the presidential palace. Vice President Gustavo Noboa took charge and Mahuad went on national television in the morning to endorse Noboa as his successor. Congress met in emergency session in Guayaquil the same day, January 22, and ratified Noboa as President of the Republic in constitutional succession to Mahuad. By completing Mahuad�s term, Noboa restored some stability to Ecuador. He implemented the dollarization that Mahuad had announced, and he obtained congressional authorization for the construction of Ecuador�s second major oil pipeline, this one financed by a private consortium. Noboa turned over the government on January 15, 2003, to his successor, Lucio Gutierrez, a former army colonel who first came to the public�s attention as a leader of the January 2000 events that led to Mahuad�s departure from the presidency. Anti-corruption and a leftist, populist platform characterized Gutierrez�s campaign. However, shortly after taking office, Gutierrez adopted conservative fiscal policies and authoritarian tactics to combat mounting opposition. The situation came to a head in April 2005 when political opponents and popular uprisings in Quito forced Gutierrez to resign the presidency and leave the country. In the aftermath, Vice President Alfredo Palacio was confirmed as the new president, and a new majority coalition of opposition political parties reclaimed control of Congress. A semblance of stability has returned, but the Palacio administration remains weak amid popular pressure for reform. The constitution provides for 4-year terms of office for the president, vice president, and members of Congress, although none of the last three democratically-elected presidents have remained in office much beyond two years. Presidents may be re-elected after an intervening term, while legislators may be re-elected immediately. The executive branch includes 15 ministries. Provincial governors and councilors, like mayors and aldermen and parish boards, are directly elected. Congress meets throughout the year except for recess in July and December. There are twenty 7-member congressional committees. Justices of the Supreme Court are appointed by the Congress for indefinite terms. Ecuador maintains an embassy in the United States at 2535 15th Street NW, Washington, DC 20009 (tel. 202-234-7200). Consulates are located in Atlanta, Boston, Chicago, Dallas, Denver, Houston, Jersey City, Los Angeles, Miami, New Orleans, New York, San Francisco, and San Juan, Puerto Rico. Ecuador's political parties have historically been small, loose organizations that depend more on populist, often charismatic, leaders to retain support than on programs or ideology. Frequent internal splits have produced extreme factionalism. No party has ever elected more than one president in recent years. Although Ecuador's political elite is highly factionalized along regional, ideological, and personal lines, a strong desire for consensus on major issues often leads to compromise. Opposition forces in Congress are loosely organized, but historically they often unite to block the administration's initiatives. Currently a majority coalition of three of the main parties holds 53% of the seats in Congress, and effectively controls congressional leadership. Constitutional changes enacted by a specially elected National Constitutional Assembly in 1998 took effect on August 10, 1998. The new constitution strengthens the executive branch by eliminating mid-term congressional elections and by circumscribing Congress' power to remove cabinet ministers. Party discipline is traditionally weak, and routinely many congressional deputies switch allegiance during each Congress. However, after the new constitution took effect, the Congress passed a code of ethics that imposes penalties on members who defy their party leadership on key votes. Beginning with the 1996 election, the indigenous population abandoned its traditional policy of shunning the official political system and participated actively. The indigenous population has established itself as a significant force in Ecuadorian politics, as shown by its early participation in the Gutierrez administration. 2006 will see the next scheduled presidential and congressional elections, according to the following timetable: Congressional election and First Round of Presidential Election- October 14, 2006; Runoff presidential election - November 26, 2006; Congressional inauguration - January 5, 2007; Presidential inauguration - January 15, 2007. The Ecuadorian economy is based on petroleum production and exports of bananas, shrimp, and other primary agricultural products. In 2004, oil accounted for over 50% of total export earnings. Ecuador is the world's largest exporter of bananas (about $1.2 billion in 2004) and a major exporter of shrimp ($319.3 million in 2004). Exports of nontraditional products such as flowers ($345 million in 2004) and canned fish, including pouch tuna ($331 million in 2004) have grown in recent years. Industry is largely oriented to servicing the domestic market. Deteriorating economic performance in 1997-98 culminated in a severe economic and financial crisis in 1999. The crisis was precipitated by a number of external shocks, including the El Nino weather phenomenon in 1997, a sharp drop in global oil prices in 1997-98, and international emerging market instability in 1997-98. These factors highlighted the Government of Ecuador's unsustainable economic policy mix of large fiscal deficits and expansionary monetary policy and resulted in an 6.3% contraction of GDP, annual year-on-year inflation of 52.2%, and a 65% devaluation of the national currency in 1999. In 2000, President Jamil Mahuad announced that Ecuador would adopt the U.S. dollar as its official currency. Shortly thereafter Mahaud was forced from office, but his vice president who assumed the presidency, Gustavo Noboa, stayed with the dollarization policy and completed the transition later that same year. The rate of inflation soared to an annual rate of over 96% is 2000. However, since dollarization, the inflation rate has continued to drop each year until it reached 1.9% in 2004, lower than the rate in the United States. One of the first acts of the incoming Lucio Gutierrez administration in 2003 was the negotiation of a standby agreement with the International Monetary Fund. Though his administration�s fiscal economic policies were sound, the Gutierrez administration was never able to enact the structural reforms the country needed. The IMF standby agreement lapsed in 2004. Buoyed by higher oil prices, the Ecuadorian economy experienced a modest recovery in 2000-01, with GDP rising 2.8% in 2000 and 5.1% in 2001. GDP growth leveled off to 3.4% in 2002. Ecuador experienced modest GDP growth of 2.7% in what the Government of Ecuador called a transition year in 2003. Spurred by high oil prices and the completion of a second oil pipeline (the Trans-Andean Oil Pipeline or OCP, in Spanish) in late 2003, GDP growth for 2004 reached nearly 7%. Though Ecuador has a relative abundance of oil reserves, it has been unable to take full advantage of those resources for its own development. Mismanagement, lack of investment and corruption in the state-owned oil sector has caused declines in state oil production over the last decade. Commercial disputes as well as judicial and contractual uncertainties have deterred private oil and other companies from investing in the country. The electricity and telecommunications sectors also have similar significant problems, which are costing Ecuadorians hundreds of millions of dollars each year. As much as 70% (statistics vary) of the population lives below the poverty line. The United States and Ecuador have maintained close ties based on mutual interests in maintaining democratic institutions; combating narcotrafficking; building trade, investment, and financial ties; cooperating in fostering Ecuador's economic development; and participating in inter-American organizations. Ties are further strengthened by the presence of an estimated two million Ecuadorians living in the United States and by 150,000 U.S. citizens visiting Ecuador annually, and by approximately 20,000 U.S. citizens residing in Ecuador. More than 100 U.S. companies are doing business in Ecuador. The United States assists Ecuador's economic development directly through the Agency for International Development (USAID) and through multilateral organizations such as the Inter-American Development Bank and the World Bank. In addition, the U.S. Peace Corps operates a sizable program in Ecuador. Total U.S. assistance to Ecuador exceeded $65 million in FY 2004; it is expected to amount to over $50 million in 2005. The United States is Ecuador's principal trading partner. In 2004, Ecuador exported about $3.5 billion in products to the U.S. For 10 years Ecuador benefited from duty-free entry for certain of its exports under the Andean Trade Preferences Act (ATPA) and received additional trade benefits under the Andean Trade Promotion and Drug Eradication Act (ATPDEA) in 2002. Those benefits will expire in 2006. In May 2004 Ecuador entered into negotiations for an Andean free trade agreement with the U.S., Colombia, and Peru. The negotiations are expected to be concluded in 2005. Both nations are signatories of the Rio Treaty of 1947, the Western Hemisphere's regional mutual security treaty. Although there are problems with money laundering, border controls, and illegal alien immigration, Ecuador shares U.S. concerns over narcotrafficking and international terrorism and has energetically condemned terrorist actions, whether directed against government officials or private citizens. The government has maintained Ecuador virtually free of coca production since the mid-1980s and is working to combat money laundering and the transshipment of drugs and chemicals essential to the processing of cocaine. It has recently given greater priority to combating child labor and trafficking in persons. Ecuador and the U.S. agreed in 1999 to a 10-year arrangement whereby U.S. military surveillance aircraft could use the airbase at Manta, Ecuador as a Forward Operating Location to detect drug trafficking flights through the region. Ecuador claims a 320-kilometer-wide (200-mi.) territorial sea. The United States, in contrast, claims a 12-mile boundary and jurisdiction for the management of coastal fisheries up to 320 kilometers (200 mi.) from its coast but excludes highly migratory species. Although successive Ecuadorian governments have declared a willingness to explore possible solutions to this issue, the U.S and Ecuador have yet to resolve fundamental differences concerning the recognition of territorial waters.